We should all be pretty familiar with the grind/death machine that is Exhumed. Formed in 1990 when guitarist and vocalist Matt Harvey was a mere fifteen years old, they spent the ensuing years recording and releasing a number of demos, split releases and Eps. Their focus has always been on grinding death metal with an emphasis on old school, drawing influence from the likes of Carcass, Repulsion, Terrorizer and earlier releases from Entombed. 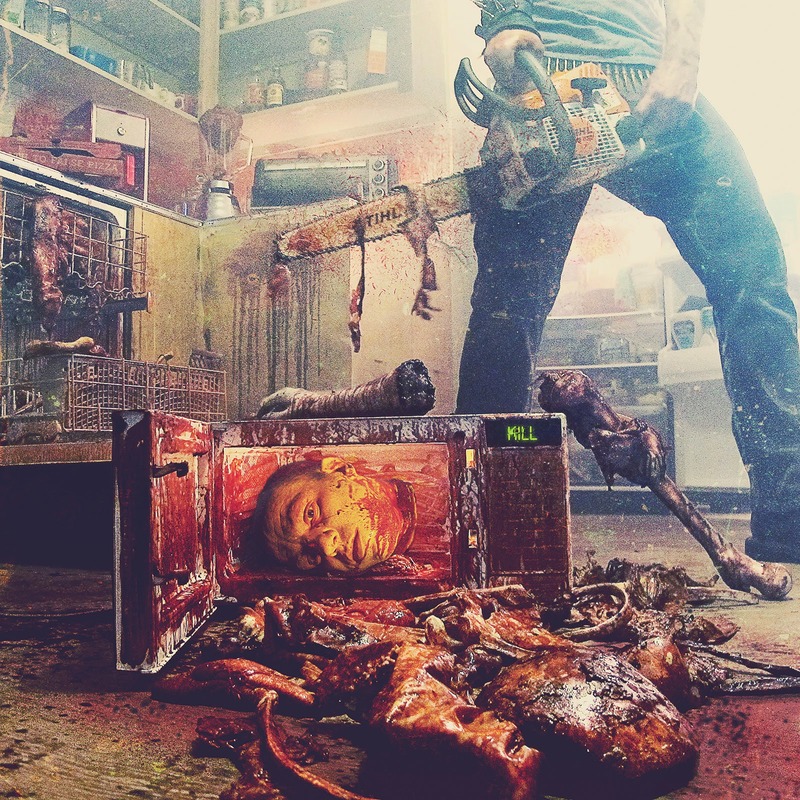 "…a classic piece of blazing gore metal with death on its mind from start to finish." – MetalSucks. 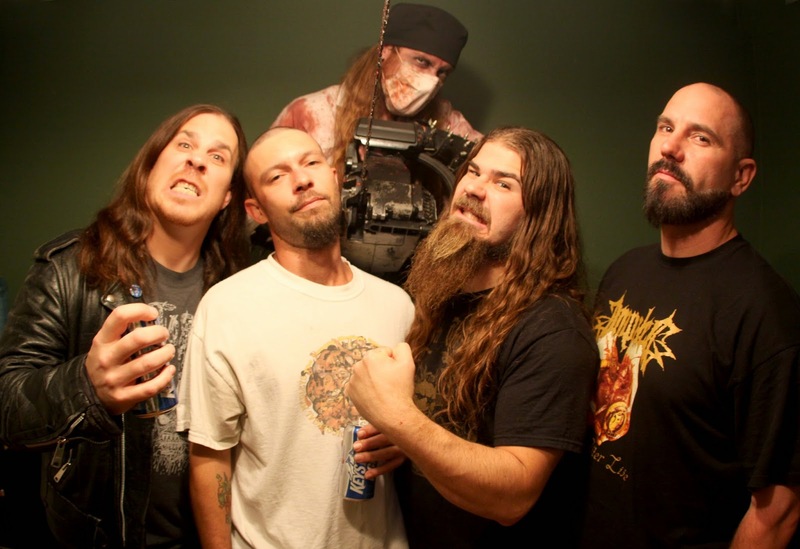 Exhumed went on to tour the United States with Gore Metal and subsequently released a number of other albums before taking a hiatus in 2005. In 2010 Exhumed announced they were to reform with Matt stating the reason for reformation was his rejuvenation during their hiatus and also to continue with the work and music Exhumed had already started, taking it to another new level as opposed to embarking on a nostalgia trip. All Guts, No Glory was released in 2010 with the band touring extensively in support of it. Fast forward to the current day and Exhumed, not content to leave Gore Metal the disappointment they’d previously alluded to it being, returned to the studio to re-record it. Unlike a lot of classic re-releases this is a full re-work with the band entering the studio to fully re-record their cult classic. The result of this is Gore Metal: A Necrospective 1998-2015 which has just been released via Relapse Records. Thankfully the album manages to retain its original raw, pent up, gory and brutal aggression whilst advances in recording technology and years of touring have drastically sharpened the band which enhances the listening experience. Listening to both albums back to back is like comparing day to night – gone is the fuzzy, low quality, almost amateur sound and in come razor sharp guitars, much cleaner sounding drums and a much tighter performance all in all. I’m rarely a fan of rehashing/redoing older material but in the case of Gore Metal it’s an astounding improvement which fully justifies the re-record. With regards to the re-recording Matt Harvey recently stated “I'm super pumped that we got the chance to re-record Gore Metal. I don't think any of us were happy with how it turned out the first time around, so getting another shot at it meant a lot to me personally. I was also really excited to have our old friend Ross Sewage reprise his vocals on the new version, ensuring that it still sounds like that era of Exhumed, though things are a lot more audible this time around!" This by all means is a must-have album – it was an absolute smasher to begin with that now sounds much better; if you have and enjoyed the original I suggest you get this. Likewise if you’re new to the band then make this your starting point. The album now features completely new artwork and very detailed liner notes and has just been released by Relapse Records in a number of formats – it’s available digitally, as a limited edition LP and also in a very impressive deluxe cd box set which, for the same price as a single cd, also contains the original recording. Exhumed are currently in the midst of a massive US tour, alongside Napalm Death and Voivod, playing thirty five shows on the tour which concludes in Houston, Texas on 28th February – now that’s a tour that’ll leave your neck in an absolute mess! Gore Metal is currently available worldwide from Relapse Records with United Kingdom Extreme Metal (UKEM) also stocking it for shipment within the UK and Europe with worldwide postage also available. (http://www.ukemrecords.co.uk/). 12. Deadest of the Dead. Backup vocal “Slay Team”: Alejandro Corredor, Dr. Philthy. Gore Metal: A Necrospective is available now from Relapse Records on CD and Vinyl.